As Johnson City lies at the foothills of the Appalachian Mountains, the perfect location of the Tri-Cities allows bluegrass music to expand its deep roots, yet true bluegrass is not determined by the location; but rather, the heart of the artist. Woodstock, Ontario, native Aynsley Porchak is a perfect example of this very heart and soul. Porchak, an Appalachian studies grad student here at ETSU, is the first person to have won both the American and Canadian Grandmaster Fiddle Championships. She earned a double bachelor’s in both English and bluegrass from ETSU, and has always possessed a genuine love and talent for music. Porchak began playing the fiddle at 9-years-old and developed a passion for bluegrass and competition quickly. “From a little girl, my teachers always talked about competition,” said Porchak. Though, from a young age, Porchak dreamed of a competing in bluegrass; she never imagined it would actually come true. 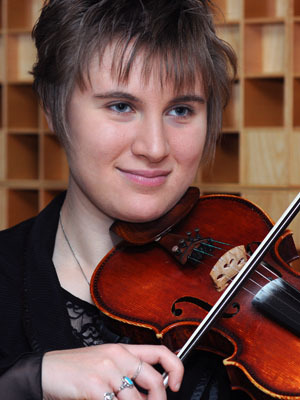 Not only did it come true, but Porchak quickly proved her tremendous musical talent by winning both the American and Canadian Grand Master’s Fiddle Championships. There must be an immense sense of pride to win for both her home town in Canada and her college community here in Johnson City. Porchak explained just how unexpected the award was. In fact, the fiddle player did not even intend to compete in the 2017 Canadian Grand Masters Fiddle Championship due to time constraints. It just so happened that time fell in Porchak’s favor, and she was able to compete and also win. After this amazing achievement, Porchak plans to focus on earning her graduate degree. Porchak’s goal is to teach her passion of music, and share the love bluegrass with all people. “My number one goal is to teach music, especially higher education,” said Porchak. The skilled fiddler hopes to even possibly teach at ETSU in the future. “I love the diversity [of ETSU], we have so many awesome teachers here, it’s a blessing,” said Porchak. Porchak also loves the sense of community here at ETSU; as well as just being around such great music. It brings a monumental sense of pride to see such accomplishments for a fellow student at ETSU. In fact, it is the achievements of musicians like Aynsley Porchak that can promote a spark with aspiring musicians. “Take all the opportunities given to hone your craft and really enjoy the opportunities that music has given,” said Porchak when asked what advice she has for ETSU’s aspiring musicians. It brings ETSU great pride to congratulate such an accomplished student. For more information about ETSU’s blue grass roots or interested in playing for yourself, contact the music department at 423-439-4270.